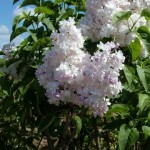 This is a large shrub also knows as Beauty of Moscow Lilac. 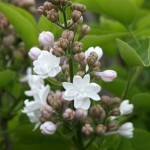 The very fragrant, double flowers are blush pink in bud, opening to snowy white, giving the flowers a two-toned effect. Prune after flowering for form and to encourage next years blooms. It prefers full sun and a well-drained soil.